US Islands Awards Program – The United States Islands Awards Program (USI) covers the islands of the fifty states of the United States and its Territories and Protectorates. These islands can be along the coastal shores, in lakes, rivers, ponds, and streams. WU4I, TN024R Looney, Tennessee River, Knox Co. The minimum QSO count for island qualifications has been lowered from 25 to 15. The 2 DXCC QSO requirement during an island qualification has been dropped. Eligible bands for island qualifications have been expanded to include 6 meters and satellite QSOs. The USI is offering a special, 25th Anniversary award for both chasers and activators running from January 1 to December 31, 2019. Chasers: Confirm 25 islands during 2019, as a club or individual. Activators, expeditions: Qualify or activate a total of 25 islands in any combination. A minimum of 15 QSOs must be made for both a new island qualification and an island activation to be considered for this award. This can be issued to a club call, (multiple members under one call) or individual. 1.) For each activation, operate for a minimum of 2 hours and make the minimum 15 QSOs. 2.) Notify usislands.org using the calendar form so your activation can be posted to the calendar and Facebook group. 3.) Call CQ US Islands and hand out the USI number. Like chasers and expeditions, this award is issued to a single club or personal call sign. Under our honor system, send the Award Chairmen, NS4J a list of confirmed or activated islands. The list should include, Name, Call, address, email, USI number, island name, date worked or activated, Call used or worked and all operators and calls. Welcome to the U.S. Islands Awards Program (USI) web site. USI is an amateur radio award program centered around chasing and activating river, lake and ocean shore islands within the 50 United States and its Territories and Protectorates. Numerous achievement awards are available for both island activators and island chasers. U.S. Islands is a great way to go on a mini-DXpedition without spending a lot of money. Discovering islands in your own back yard and setting up a station outdoors is always a good time. If hams have only operated outdoors during Field Day, we offer another route to get outside and enjoy portable ham radio in a different way. One-Day-Getaway is just that, a casual day of island portable operations the second Saturday of May. Activating or qualifying a new island, 1DG is a perfect way to hone your on the air operating skills and perfect your portable or mobile “field day kit”. The W/VE Island QSO Party is our once a year “contest” that has a class for just about any individual or group. Operate from a friends island “Fixed” QTH, take your club on a single island “Expedition”, or go on a mobile or waterborne “Rover” adventure. Any way you like it, portable, walk on, paddle to, motor to, mobile, drive on, USI is year around ham radio fun. Please consider joining the USI Facebook group. 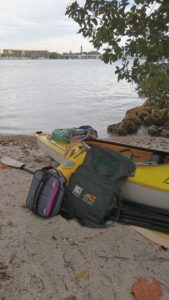 Gear and kayak for Fullerton Island, FL544 qualification run. Wayne K4WK.